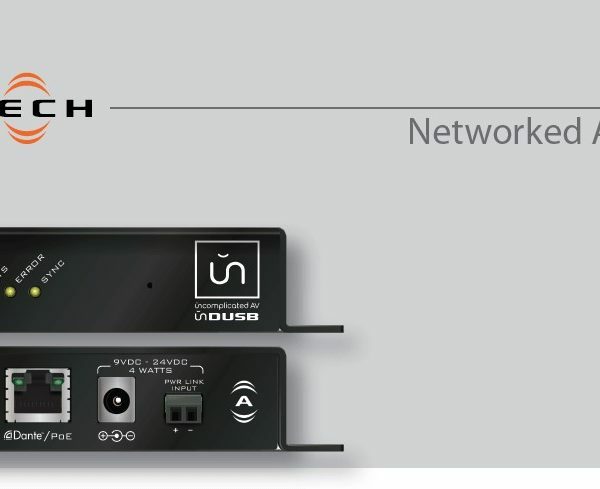 The unDUSB is a small, cost-effective interface that bridges host USB devices, like computers, directly to a Dante™ network – while keeping the audio signals in the digital domain. The unDUSB enumerates on USB as a standard stereo sound card, and provides 2 channels from Dante™ to USB, and 2 channels from USB to Dante™. Since the unDUSB uses USB audio drivers that are built-in to Windows and OSX, no additional drivers need to be installed. Using an unDUSB, any computer program that can make use of a stereo sound card can instantly have input and output access to audio signals on a Dante™ network. Music, presentation audio, and even audio from collaboration applications like Skype can be used in a Dante™ system. The unDUSB can be powered by compliant 802.3af PoE devices, from +9VDC to +24VDC external supplies, or from the Power Link Output connector of other Attero Tech devices that support Power Link.